You can add an image (sometimes transparent and called a watermark) to the slide master so that it appears on every slide in the presentation. For example, you might have a company logo that you want to include on every slide. In the Slide Master view, select the slide master at the top of the thumbnail pane on the left. On the Slide Master tab of the Ribbon, click Background Styles. 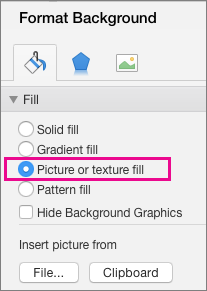 To insert a picture from your computer, click Picture or texture fill. Locate and select the picture you want, and then click Insert. Your selected image will fill the background of the slide master in the thumbnail pane and all the layout masters below it. If you want to create a watermark effect, in the Format Background pane, slide the Transparency bar to the right to set the opacity percentage. On the Slide Master tab, click Background Styles. Your selected image will fill the background of the layout master or masters that you selected in step 2. On the View menu, point to Master, and then click Slide Master. On the Home tab, under Insert, click Picture, and then click Clip Art Browser. Note: When you search for clip art and pictures online, you'll be directed to Bing, where you can save the image on your computer, and then insert it in your document. When using pictures or clip art from Bing, you're responsible for respecting copyright, and the license filter in Bing can help you choose which images to use. Drag the clip art that you want to the slide master. On the Format Picture tab, under Picture Styles, move the Transparency slider to the right to lighten the clip art color. Select the image, position the pointer over a sizing handle, and then drag the handle until the image is the size that you want. Tip: To maintain the clip art proportions, hold down SHIFT as you drag the cursor. 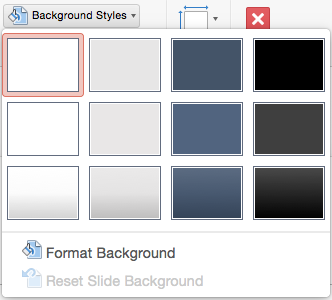 If the watermark doesn't appear on one of your slides, on the Format menu, click Slide Background, and then make sure that the Hide Background Graphics check box is not selected. If you want the watermark to appear on only one slide, create the watermark in normal view. Drag the picture that you want to the slide master. On the Format Picture tab, under Picture Styles, move the Transparency slider to the right to lighten the picture. Tip: To maintain the picture proportions, hold down SHIFT as you drag the cursor. On the Home tab, under Insert, click Shape, point to any shape type, and then click the shape that you want. Click the slide master, and then drag the cursor to the size that you want. Tip: To maintain the shape proportions, hold down SHIFT as you drag the cursor. On the Format tab, under Shape Styles, move the Transparency slider to the right to lighten the shape color. On the Home tab, under Insert, click Text, and then click WordArt. To change the WordArt fill or outline color, on the Format tab, under Shape Styles, select a style from the gallery or use the Fill, Line, or Effects options. To change the WordArt text fill or outline color, on the Format tab, under Text Styles, select a style from the gallery or use the Fill, Line, or Effects options. On the Format tab, under Shape Styles, move the Transparency slider to the right to lighten the WordArt. Select the WordArt, and then drag it to its new location. Select the WordArt, position the pointer over a sizing handle, and then drag the handle until the WordArt is the size that you want. Select the WordArt. On the Format tab, under Arrange, click Rotate, and then click an option.